Now that we have a baby, we’re actually considering a personalized holiday card for our family. Don’t get me wrong, we’re a far cry from matching, red, knitted sweaters but the idea of sending our parents, siblings, and grandparents a family picture is appealing. After all, they ask for pictures daily and they do live in another country and miss Athena, and us, dearly. Shutterfly has a wonderful new collection of Holiday Cards this year from traditional colors and embellishments to merry and bright colors that take on a modern feel. They also feature religious/scripture based cards (including Hanukkah) and cards that you can showcase your fur babies photos on. Whatever your style, their are sure to have something you’ll love. Maybe it’s not as “Christmas like” as the others, but our favorite is the black and white design with the red strip in the middle. Do you have a favorite? We didn’t finalize our decision yet. If you have a favorite, let me know. We want something that highlights Athena but still includes us. I’d like it to be fun, too, but not overly “here’s my perfect family” because that’s not us either. Oh the decisions! Would you like to enter a prize giveaway sponsored by Shutterfly? Click here to enter our giveaway for $50 off any order of $50 or more. Bucket List Publications also has another giveaway going on right now for a Bodum Bistro Burr Grinder. You can enter here. This entry was posted in Uncategorized and tagged bucket list, Bucket List Publications, Christmas, Giveaway, Giveaways, Holidays, Shutterfly, travel, Travel blog, travel magazine by lesleycarter. Bookmark the permalink. 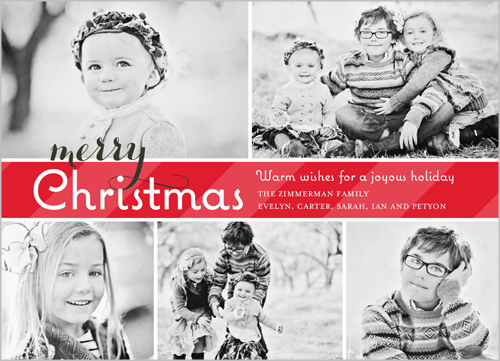 I LOVE shutterfly… ordered my cards and got them a week ago! I’d totally use them again and again! I haven’t ordered a photo book yet…but just did ‘family’ calendars for my family (Gramma, Aunts & Uncles, Cousins, Brothers/Sister-in-laws!) I can’t wait for them to come in the mail. I hope they arrive before I go south for holidays! 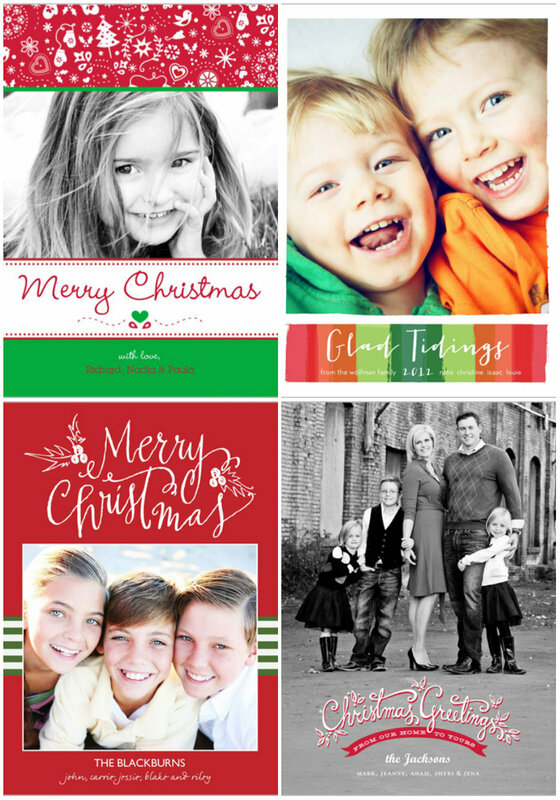 I love shutterfly and I do use them but I strongly dislike family picture holiday cards. I’d really rather someone send me a Christmas (or Hanukkah or whatever holiday they celebrate) card and enclose a 4 x 6 photo of them and their family. That way I can frame the picture or put it in an album or whatever without having to keep the holiday words scribbled all over it. My wife is a BIG Shutterfly fan. We buy a few photo books every year as Christmas gifts for relatives, and their frequent sales save her lots of money on photo-prints for our road-trip scrapbooks. As for the cards, I’m partial to the black-‘n’-white “Christmas Greetings” design, If I had just the right photo to complement it. I love Shutterfly too– I have several photo books made by them, as well as many cards. Their print quality is outstanding! Understand the temptation to do something Christmassy. I am loathe to admit it but as we are going home for Christmas I am considering getting a pack of the Christmas-themed disposable nappies! I love Shutterfly! I swear I should own stock in them!! I haven’t done the family photo custom card, but I have taken my Alaskan winter pictures and created my own Christmas cards with Shutterfly. One of my favorite sites! Easy to use…easy navigation….great quality! Fantastic Promos/Coupons!! I like the Christmas Greeting card… if you are looking for an opinion 🙂 Plus free shipping to Alaska applies! (of course if you spend over X amount). You don’t know how exciting that is! I’ve gone to sites where I fill up my cart and when I go to check out “Free Shipping” doesn’t apply to AK…..I’m forced to select 2nd day air for $40. So annoying! Any way, have fun creating your card! We left it to late last year so made up a mini-movie using iMovie, using both photos and some video clips and then emailed everyone that instead. It was a big hit so we will be doing the same again this year. On an added bonus it is free, totally unique to you and more environmentally friendly. Show us what you picked, please! 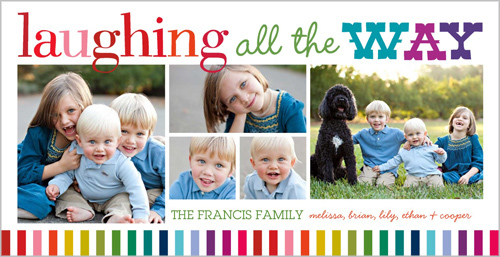 Grandparents, friends, everybody loves the picture cards when there are kids on them. I loved sending “picture” cards when my three were little. It let the family back east see them grow up. Two. I agree. The last one. Black and white photos always get my vote anyway but the last card is actually really pretty. Show us the cards when you get them. I love them all! We ordered our cards through Snapfish and the designs were similar, I went with colour but love the black and white cards as well. Excellent post. So, how many more shopping days until Christmas? I just had to comment here, because I bet your holiday card will be an exciting one! I hope so 🙂 Bunging jumping, rock climbing, scuba diving, etc., Happy Creating! Very pretty… definitely with you on the black & white and red striped design. The last one (black & white) is the nicest. We use Shutterfly all the time of our photobooks. A few other sites allow more creativity, but their image storage is the best we’ve found. We have been using Shutterfly now since we had our first baby and his is 9 now!!! Love how they change up their designs every year. I just ordered mine earlier in the week and was able to get 40% off!!! I just received a Shutterfly offer & have never used it before so I wasn’t sure if I would. Good to see some examples & get a little more info, makes it worth looking into. I like the black/white with red strip in your post. I have been cutting and pasting and gluing and making my own cards, photos and albums for years… but only when I have time. I think it’s now time to check out Shutterfly and make it easier on myself! Thanks for the post. I tried “liking” this, it won’t let me. We have been doing Shutterfly cards for years. Last year we made calendars instead. Love them both! The B/W one with the red strip down the middle is my favorite! I think it’s classic and adorable. Good luck hope you post your card so we can see it. I’m a Shutterfly customer as well. Have made my own photo book, desk top calendar and a birthday greeting card. All were great quality. I use Shutterfly for everything! Photo albums (and groupon has great deals on these), printed pics, mailing labels, and we just took our first family photos for Christmas cards last week!! Merry Christmas and Happy Holidays Lesley…. We are doing a holiday card this year and we don’t have a baby. But so much has changed in our lives that we felt it was the perfect way to update our friends and family. We went with http://www.minted.com/ Great designs and they are having a sale right now.